Nowadays, Thai cuisine can be found almost anywhere in the world. If you’re coming to Thailand, it’s safe to assume you will be familiar with Pad Thai and Green Curry. Well, guess what? You’re in for a treat because one of the many joys of Thailand is its culinary variety! Thailand is divided in to four distinct regions and each one of them has its own delicious cuisine. However, much of what appears on restaurant menus outside of Thailand is limited to food from central Thai cuisine. We want to introduce you to the delights of the full spectrum of Thailand’s regional cuisines. What’s more, we want to show you how you can enjoy all four of them right here in Bangkok. Bangkok is unquestionably a foodie city, catering for every budget and every preference. All major world cuisines are represented here and the adventurous foodie has a new experience waiting for them around every corner. To the untrained eye, though, much of Thailand’s regional cuisine may be difficult to distinguish from each other. Follow our guide to get the most out of Thai cuisine and to appreciate the rich diversity of Thailand’s geography told through its food! Central Thai cuisine is dominated by Bangkok, the beating heart of Thailand, and is famous for the quality of the rice grown here. It’s also the birth place of the famous green curry, Kaeng Khieo Wan, and the equally loved Tom Yum Goong, hot and sour soup. 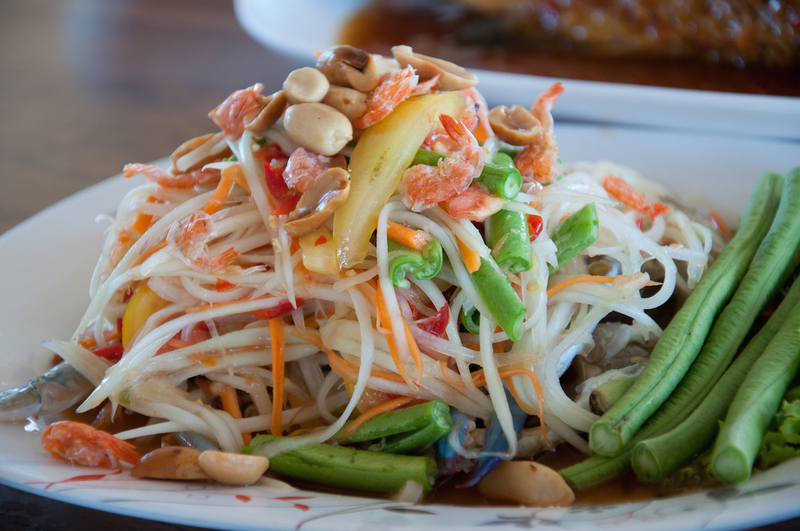 The Som Tam salad has a Central cuisine variety, too, using brined shrimp to enhance the flavour. There are no shortage of places to eat Central Thai cuisine in Bangkok, but here are our two recommendations. For a truly authentic Thai Green Curry, head to White Flower Factory at Pathum Wan. We think it’s excellent! If you’re feeling more adventurous, a two generations old street food stall in Banglamphu, Tom Yum Goong Banglamphu, makes a fine example of a Tom Yum with prawns. 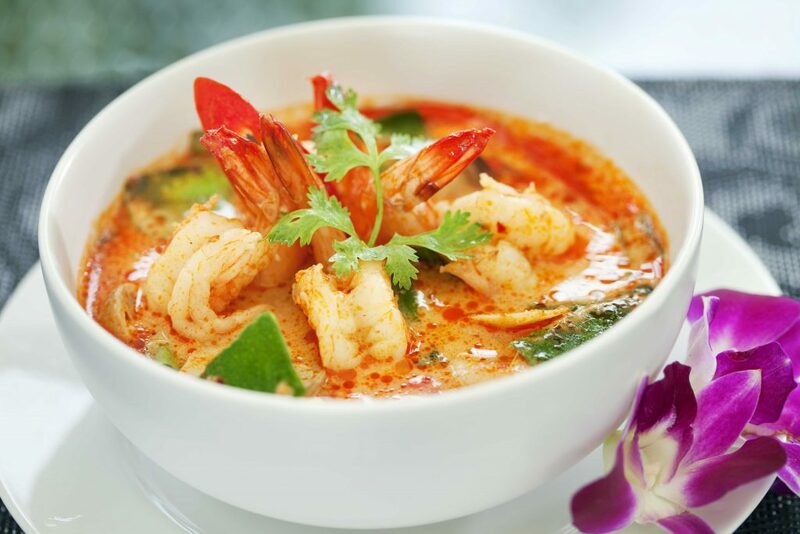 Order their signature Tom Yum Goong! Isaan, the northeastern region of Thailand, is a Thai cuisine famous for its grilled meats, sticky rice, strong fermented salads, and many herbs. Popular in all four regions of Thailand, is is also particularly liked by first time visitors. It’s also the easiest regional variety to find outside of its native territory. This is because many people from less well off Isaan brought their food with them when they left to look for work. A typical Isaan meal will comprise several components. Gai Yang, grilled chicken, accompanied by Som Tam, spicy papaya salad, Larb Moo, a minced pork salad, and sticky rice. There are a multitude of different combinations, but in Isaan Thai cuisine, it’s all about a balance of flavours and tastes. Spicy, sweet, sour and salty will all be represented on the Isaan kitchen table. There is no shortage of excellent Isaan eateries in Bangkok. A favourite with Bangkok’s ‘in the know’ crowd is Kai Yang Sua Yai. Trendy yet authentic, it’s grilled whole chickens and fermented fish with chilli are must-trys, best accompanied by a cold SIngha beer. If you prefer a more street-food style ambience, then we suggest Som Tam Jay So, right in the heart of Silom. Fiery papaya salads are flavoured just the way Isaan natives like it, rather than the sweeter varieties favoured by Bangkokians. 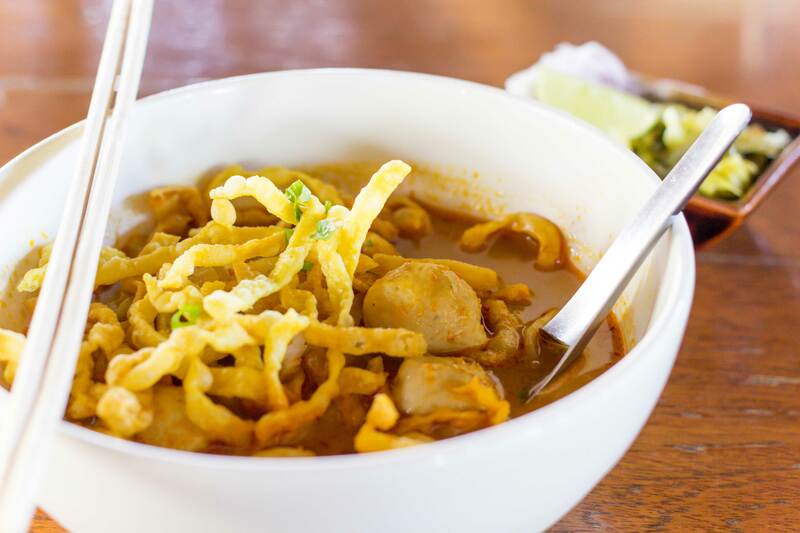 Also known as Lanna cuisine, visitors to Chiang Mai fall in love with their first bite of the delicious Khao Soi noodles. Flavour and texture contrasts dominate a red and yellow coconut curried broth, and crunchy noodles are piled on top of the soft noodles and chicken thigh found underneath it. However, there is more to Northern Thai cuisine than Khao Soi. 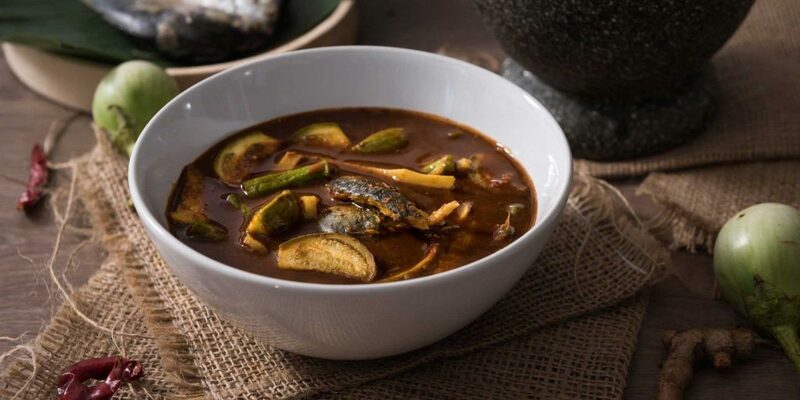 Influenced by the countries that share a border with the north, delicious foods such as Kaeng pa, jungle curry, Sai ua, northern sausage, and Tam som-o, a spicy pomelo based salad proudly show-off the flavours of this region. If you’re not planning on heading north when you’re in Thailand, don’t miss the opportunity to try northern cuisine in Bangkok. One of our favourite Northern restaurants in Bangkok is Huen Lum Phun. Offering the full range of Northern Thai cuisine specialities, even the decor is true Lanna style. For something a little more adventurous, take a trip to Silom Soi 10’s food court Khao Soi stand. Located in the far corner of the food court, it’s worth the effort to find this street food stand. Offering northern noodles in a typically unfussy setting, this is a well hidden Bangkok secret. Delicious! Perhaps the least well known and understood of Thailand’s regional cuisine, southern Thai food is characterised by its spice and sharpness! Just like the north, southern Thai cuisine shares flavours from its neighbours, particularly Malaysia and Indonesia. Southern Thai cuisine is based heavily around seafood and meats and uses lots of lemongrass and kaffir lime leaves for flavour. Staples include Gaeng tai pla, fish curry, Gaeng som pla, a fiery soup, and Kua kling, a dry curry made with meat. Southern Thais in need of a taste of home in Bangkok rely on the long standing favourite Baan Ice. With its emphasis on fresh seafood, we highly recommend its crab dishes! At the other end of the spectrum, a more low key affair at Khua Kling Pak Sod Restaurant will leave your taste buds tingling from the spice, but craving more! Want to diver deeper into Thailand’s regional cuisiney? Why not join us on a TakeMeTour Bangkok food tour? Or if street food is your thing, let one of our local experts show you Bangkok’s best street food spots!